As political uncertainty dragged on, violence between the four-party and the 14-party alliances rolled into the second day yesterday across the country, leaving scores injured and properties damaged. The two power contenders led by major parties Awami League and BNP fought for supremacy on streets in district towns, clashing with each other, attacking rival party offices and damaging public property. People were virtually hostage as life was paralysed, according to reports by our correspondents. The 14-party alliance's besiege programme virtually turned into a hartal in seven upazilas of Gaibandha district yesterday. Vehicles kept off the road and train movement was suspended fearing violence, according to Railway control room in Lalmonirhat. Shops and markets remained shut all day long. 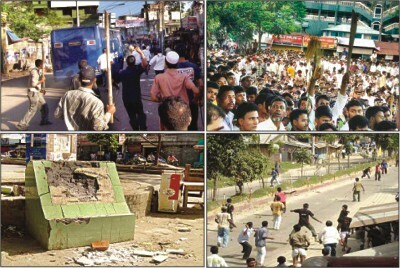 In Sadullapur upazila headquarters, streets turned into battlefields as Awami League and Jamaat activists clashed and chased each other during processions. Four Jamaat activists were injuried. Agitated activists of 14-party alliance also burnt the Jamaat office at Saduillapur. In Fulchari, 14-party alliance activists compelled shopkeepers to down their shutters and desist office-goers from going for work. Banks did not operate. The demonstrators barricaded Balashi ferry terminal. In Gaibandha town, Jamaat brought out a stick procession at about 3 pm as a show of strength against 14-party's showdown earlier on the day. Later they held a meeting on the Shaheed Minar premise, where speakers said nothing will go unchallenged. Earlier, at about 10 am, 14-party alliance held a protest meeting at Shaheed miner, presided over by its convener Abu Bakker Siddique. It was addressed by, among others, Aminul Islam Golap, Shah Shariful Islam Bablu, Moinul Huq Raja, Lutfar Rahman Ranju, Farhad Abdullah Harun, Shah Masud Jahangir, Kabir Milon, Shah Ashraf Kabir, Mostaque Ahmed Ranju and Sujan Proshad. They called upon the President to appoint a non-partisan person as head of caretaker government immediately effect to avoid anarchy in the country. Section 144 was imposed for an indefinite period within 1000 yards of offices of BNP, Awami League, Jamaat, Workers Party and other political parties and areas in and around the Sadar Road, Hemayetuddin Road, Fakir Bari Road in the city yesterday afternoon to check the deterioration of the law and order situation. Patrol by police, APBN and Rab was increased in the city. Tension mounted in the city as one more BNP activist succumbed to head injuries at Barisal SBMCH yesterday morning. The victim was identified as Abul Kalam, 30, son of Abul Hossain of Jagotpatty of Swarupkati upazila under Pirojpur district. He was injured during Saturday's clashes with 14- party activists at Sadar Road in the city. The 4-party activists yesterday torched an office of Workers Party at Fakir Bari Road, which was also used as offices of Left Front and 11 Party. Local people extinguished the fire. The 4-party activists also attacked the house of Nizamuddin, a BCC ward commissioner and city Jubo League convener at Fakir Bari Road. The roadblock enforced by the 14-partt continued in Barisal city and adjacent areas. Banks and other financial institutions operated under close door with limited transactions. Most of the shopping complexes and big markets remained closed. The 4-party alliance activists exercised their supremacy in the north, northwest, east, southeast and central parts of the city, while the southwest part was under control of the 14-party alliance. Awami League led 14-party alliance brought out a big procession, barricaded the Sadar Hospital road in the town and held a rally there yesterday to press electoral reforms and appointment of a non-partisan person to head the caretaker government. Speakers at the rally vowed to continue the movement to realisse the demands. Agitated supporters of the alliance pelted stones and damaged windowpanes of the office of Islami Insurance at Palashpole in the town. At Kalaroa, 14-party activists attacked the upazila BNP office and damaged ransacked it. At Shyamnagar, 14-party activists torched upazila BNP office last night. At least 37 people were injured and many houses and business offices damaged as BNP and Awami League activists clashed in different areas of the district yesterday and the night before. The seriously injured party activists included district Sramik Leauge law affairs secretary Abdul Mannan, AL activists Mizan Chowdhury and Al-Amin, Sadar upazila BNP cashier Ashok Majumder and party activists Sujit Chowdhury, Mizanur Rahman, and Mohammad Ruhul Amin. Of the injured, 15 were in Matiranga, two in Dighinala, five in Panchhari, four in Manikchhari and four in from Mohalchhari, police and party men said. Police arrested at least 20 activists of both the parties during clashes. Police and locals said BNP and AL cadres attacked on each others at Zia Nagar, Shalbagan, Shantinagor, Narikel Bagan and Sabuz Bug areas in Sadar upazila; Belchhari, Nayapara and Tabalchhari in Matiranga upazila. Clashed also took place at different areas in Dighinala, Panchhari, Manikchhari and Mohalchhari upazilas. In Khagrachhari town, the Press Club, Sramik Dal office, district election office, Shishu Academy, Comilla Samity, Bar Association office, family planning office, sericulture board Office were attacked, allegedly by BNP activists. AL district secretary Zahedul Alam told this correspondent that BNP cadres attack their men but police arrested his party men. District BNP press secretary Nazrul Islam however claimed that AL men were responsible for the attacks on offices and government property. He demanded their punishment. Bashir Uddin, officer-in-charge of Sadar thana, declined to comment on the attacks but said six cases have been filed. No vehicle plied roads in the district and most of the business centers remained closed. Awmai League-led 14-party alliance in Kushtia yesterday brought out a mourning procession and held a rally in the town protesting the killing of party activists across the country and in Kushtia on Saturday. A leader of Krishak League, AL's peasant front, was gunned down during a procession in Mirpur on Saturday, allegedly by BNP cadres. The 14-party alliance's procession started from Kushtia Shilpakala Academy. The processionists paraded the town streets and then gathered at Barabazar rail gate at about 11:30am, where the rally was held. With Kushtia AL acting president Julfikar Ali Arzoo in the chair, the rally was addressed by, among others, AL secretary Azgor Ali, Sadar upazila AL president Akthruzzaman Masum, Jatyia Samajtantrik Dal (JSD) organising secretary Golam Mohsin, former district BCL president Sheikh Hasan Mehedi and Sechchasebak League joint convenor Aktharuzzaman Labu. The speaker vowed to avenge the of killing their party men in Kushtia and in other districts. They said, AL, talking the people along will realise the demands for reforms. They urged the people to appoint an 'acceptable' person to head the caretaker government immediately to help stop the countrywide violence by BNP-Jamaat. It was a hartal-like situation in the district as vehicles kept off roads and shops and markets remained closed. Kushtia Bar Association led by its general secretary Nurul Islam Dulal barricaded the Kushtia-Khulna highway for about two hours. Over 100 people including policemen and journalist were injured in sporadic clashes involving Awami League, BNP, Jamaat and police in Belkuchi, Ullapara and Sirajganj district town yesterday. Of the injured, 45 were admitted to Ullapara and Belkuchi upazila health complexes, Sirajganj Sadar Hospital and different local clinics, while two critically injured Ullapara AL secretary Shafiqul and Jubo Dal activist Shah Alom. According to police, activists of AL and BNP-Jamaat were locked in a clash at Bazaar station square in Sirajganj town at about 9am over establishing supremacy on streets. They staged chase and counter-chase and threw brickbats at each other. The clashes soon spread to other areas of the town. The attackers were also locked in clashes with police as the law enforcers they tried to stop the violence. Police lobbed 52 rounds of tear gas shells and charged batons on the clashing groups to bring the situation under control. Fifteen people were injured in clashes between AL and BNP in Ullapara. The clash erupted when some BNP activists attack upazila AL secretary Shafiqul Islam at the upazila headquarters as he was going to UNO office to meet the UNO. At least 35 persons were injured in Belkuchi, when AL and BNP activists came head-on during processions. During the clashes, seven shops, five vehicles, two houses and a large number of signboards, billboards and nameplates erected during BNP government were damaged. The 4-party alliance kept the city'sCourt Point and other prime areas under their possession the whole day yesterday while the AL led 14-party combine remained off the streets. The 4-party activists took out motorbike processions in the city chanting slogans against 14-party for what they called creating 'anarchy' in the country. The JCD and Islami Chhatra Shibir also took out processions in the city. with Sylhet city BNP chief Ariful Haque Chowdhury in the chair. Speakers there said the AL-led 14- party is out to create an unstable situation in the country. We will not let them continue this. Peace loving people will resist them, they said. They alleged that 14-party activists attacked 4-party men in a planned way on Saturday at the Court Point when a peaceful rally was being held there. This was done at the instruction of Sylhet city mayor and district AL president, they alleged. The city mayor is now retreated to his house under police protection, the speakers said. City Jamaat chief Shafiqur Rahman, former district BNP president MA Haque, city BNP secretary Nasim Hossain, Nurul Haque, district DAB chief Dr Shahriar Hossain Chowdhury, City BNP vice-president Abul Kaher Shamim, joint secretary Badruzzaman Selim, Sylhet district (South) Jamaat Ameer Habibur Rahman and city Khelafat Majlish chief Nuruzzaman addressed the rally. Earlier, the alliance leaders also addressed a press briefing at Jamaat office, bringing allegations against the 14- party combine. An eeric silence prevails in Brahmanbaria town as most shops amd markets remained closed for the second day and vehicles kept off the rods, paralysing life. At least 25 people were injured in clashes between activists of Awami League and BNP yesterday and the day before in different areas of the district. BNP filed a murder case with Brahmanbaria Police Station accusing 39 AL workers following the killing of BNP vice-president Sheikh Md. Habibullah in a bomb attack Friday night. His younger brother Sheikh Md. Habibullah filed the case. RAM Muktadir Rabiul, former privet secretary to AL president Sheikh Hasina is the prime accused in the case. To retaliate the murder, BNP workers Saturday night damaged Siam Chinese Restaurant, a diagnostic centre and some shopping complexes in the town owned by AL leaders. On the other hand, AL workers burnt a motor cycle and damaged several vehicles on Biswa Road in Sarail and Sadar upazilas. They also damaged a BNP office at Bancharampur upazila. On Saturday, AL workers damaged two trains --- Mahanagar and Karnafuli Expressin Ashuganj upazila. The angry AL activists also damaged signal points and set ablaze railway slippers on the track at Ashuganj railway station. At least 20 passengers were injured by as they jumped through widows. On the other hand, Nabinagar upazila BNP unit at a meeting declared former alliance lawmaker Kazi Anwar Hussain (JP- Munju) 'unwanted' in the area, saying he ignored BNP men. The meeting, presided over by Nabibagar upazila BNP president Abdul Mannan, was addressed by central Krisak Dal joint secretary Takdir Hussain Jashim, local BNP leader Gulam Hussain Khan and Nabinagar Krisak Dal leader Abdul Manna Chowdhury. On the other hand, BNP leaders said they are waiting for instruction from their leader and former lawmaker Haroon-Al-Rahid, chairman of Bangladesh Red Crescent Society, to retaliate alleged vandalism and attack by AL workers. The district administration has increased the number of BDR and police deployed at sensitive spots in the town. Five platoon of BDR were deployed in the town, police source said. Section 144 would remain in force till the situation returns to normalcy, DC office sources said. Dinajpur administration imposed Section 144 yesterday in Birampur, Ghoraghat and Hili under Hakimpur upazila as Awami League-led 14 party combine and 4-party alliance called a public meeting at same places. At least 50 people were injured in clashes between Awami League and BNP-Jamaat combine in different areas of the district yesterday. The clashes erupted when Awami League-led 14- party alliance barricaded roads. Some BNP and Jamaat offices were torched during the clashes, police and witnesses said. In Parbatipur, AL activists torched at least two compartments of Dhaka Mail Saturday midnight. Being informed Parbatipur Fire Brigade defused the fire. In Thakurgaon, at least 10 AL activists were injured, three of them critically, during clashes between two BNP and AL in Ranishankail upazila. The injured were sent to Dinajpur Medical College Hospital. Later, angry AL activists set ablaze BNP and Jamaat offices in Ramishankail. In Haripur in Thakurgaon, at least four people were injured in a clash with Jamaat activists.